I Love the Burg but…Asheville! A combination of cool weather (60 to 70 degree highs! ), stunning views, numerous belly busting restaurants and, of course, tons of breweries, we can’t help but give a well-rounded grade of A for the city of Asheville, North Carolina. It probably helps that it’s just less than a 2 hour plane ride on the budget carrier, Allegiant, from the St. Pete-Clearwater airport which makes it convenient. We wonder why it took us this long to make the visit. We’ve been missing out on this cool, hip, progressive town all along. Be ready to get your beer game on! With just a population of about 89,000 people and 26 craft breweries, Asheville just ranked number 1 in the country for breweries per capita. We tried our best to drink as many pints as we can in the amount of time we were there including an entertaining brewery tasting tour of the newish New Belgium Brewing Co. which we highly recommend. Below are some of our other favorite brewery stops during our visit. One of NC’s oldest breweries. Great beer selection. Learning about its history and how it is the biggest employee owned brewery in the country is quite impressive. Employees also get a cool bike after their first year in the company! The live music outdoors is a nice touch. Good looking bartenders to go with their delicious beers on tap. Some of the best sours we’ve had! If beer is not your speed, Asheville also has plenty of cocktail bars sure to impress you with their own takes on classic libations. Beautifully designed interiors, perfect for just lounging with friends. There’s usually a line…but it’s so worth the wait. They also have a couple of branches in Asheville. Ever had an Old Fashoined that tasted like peanut butter? Oh-Em-Gee. Of course, you’ll need some delicious eats to go with all that drinking. Asheville also delivers on that front. It’s amazing how this small town can boast of so many foodie places with some of the most talented and revered chefs in the country. Here are our top foodie spots that you cannot afford to skip. They have a couple in Asheville. Best biscuits and fried chicken! Loved their sriracha slaw too. Be ready for food coma. Limited seating but at least they give you coffee while you wait. Delicious and perhaps a lighter breakfast fare. You have to try ALL the sauces. If you want to enjoy the beautiful foliage of Fall, drive through the Blue Ridge Parkway and just take it all in. The trees and mountains are simply breathtaking. 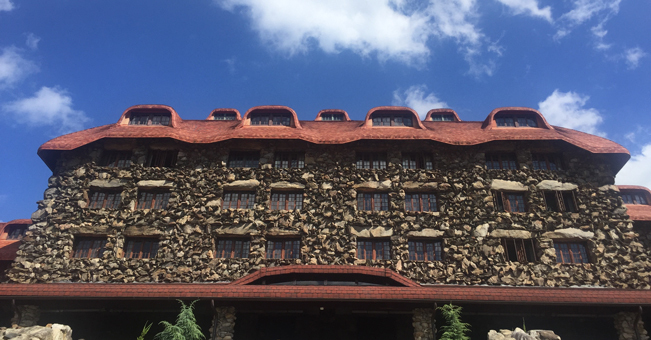 Make a pit stop at the Grove Park Inn. It may be a little pricey for a night’s stay but you can always have a nosh and a cocktail in their outdoor dining area with stunning views of the mountains. Even the hotel itself is just architecturally distinct. And if you’ve got time for some exhilarating fun, spend a few hours with your friends on one of Navitat’s zipline tours. The adventure goes will the views and you get to know more about the city and the surrounding natural beauty. They probably have the best (and funniest) guides to make the experience relaxing and entertaining at the same time. Just one more tip, finding parking in downtown can be quite the challenge. We suggest taking Uber or Lyft. But if you have to drive, park in one of the overnight parking garages which aren’t too steep. Just don’t drink and drive.